Worked great! Have you set up any ESXi hosts to boot from flash? I’ve played with HP’s ESXi 4 on flash on a demo G6 server and really dug it. You could have burned that ISO to a CD, booted the server with the CD and the USB drive attached, and installed ESXi to the USB drive directly without touching the server’s hard disks. 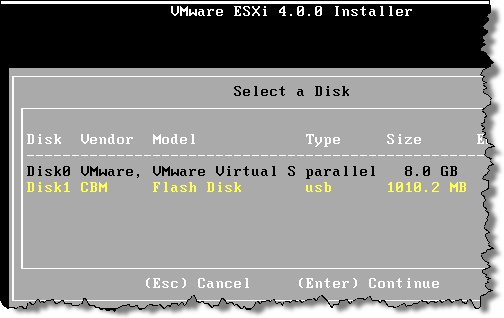 ESXi 4 has a more flexible install routine than ESXi 3.5 (I think – never deployed in production). aharden, great point, I was considering that at first but I needed to keep the servers running something else for a while longer — by preparing the flash drives in advance, I could simply reboot into ESXi when the servers were ready. Also, my servers are headless and in a lab on the other side of campus. I just wanted to walk by, insert the USB flash, and later reboot remotely to USB (using iLO) from the comfort of my desk. Eric, why didn’t you use the winimage method ? It’s because it’s faster. We both know that the VMware people are lazy…..-:)…. Just kidding. Mike Laverick has pointet that out already on one of the comments on the articles I published earlier about this. I got it Eric but, tell me if i’m wrong, if you install ESXi on usb key you got installable version not embedded ? Is that supported by VMware… ? According to the documentation, ESXi installable may be installed on a USB device. I’ve been putting together a demo environment that consists of a mini-itx system running ESX for showing off our products at VMworld. Unfortunately, the SATA controller is unsupported and consequently unrecognized. I was able to boot the system using USB installation but the local storage is not available for VMs 🙁 VM-help.com has been useful for trying to modify the oem.tgz files to work with the configured SATA controller but I’ve had little success. Come visit us at the New innovators boot #1438N. A nice reward for anyone that can make it work!